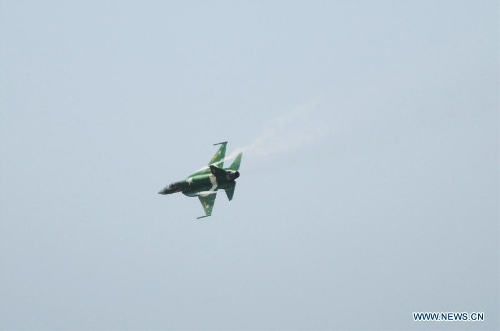 The J-10 fighter jets of the People's Liberation Army Air Force's Bayi Aerobatic Team arrived in Pakistan on Saturday in preparation for a flight performance there on March 23 in celebration of Pakistan's National Day. The Chinese pilots, invited by the Pakistani side, received a warm welcome upon arrival as local children greeted them with bouquets, China Central Television reported on Saturday. A parade is scheduled on March 23 to mark Pakistan Day, said Asif Ghafoor, a Pakistan Army spokesperson, Pakistani news website thenews.com.pk reported on Thursday. Contingents from countries including China, Saudi Arabia, and Turkey will participate in the parade, with Malaysian Prime Minister Mahathir Mohamad being the guest of honor, the report said. 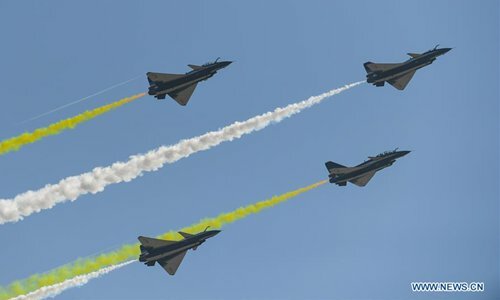 Hu Zhiyong, a research fellow at the Shanghai Academy of Social Sciences' Institute of International Relations, told the Global Times on Sunday that China sending fighter jets to celebrate Pakistan Day is symbolic of the friendship between China and Pakistan, noting that Pakistan is an all-weather friend of China. On November 19 2017, the team staged a "wonderful" aerobatic flight with J-10 fighter jets in Quetta, the capital city of Pakistan's Baluchistan province, according to China Military Online. In addition to the J-10's flight performance, Chinese analysts expect more Chinese elements at Pakistan Day parade as the country operates a variety of Chinese weapons. The Pakistan Air Force's main fighter jet, the JF-17, is a product of Chinese-Pakistani joint development, China Military Online reported. Pakistan also operates the likes of China's HJ-8 anti-tank missile and FM-90 air defense missile, according to China Military Online. Hu noted that China has contributed to Pakistan's military development, as China has been helping the country with its national defense industry for decades. China is likely to have more joint development projects and arms sales to Pakistan in the future, analysts said.